If you are in the North Texas area, you may want to check out these events happening in the next few days. Friday, December 12: Gainesville, a town about 75 miles North of Fort Worth, is having a "Victorian Stroll" all weekend. Downtown businesses are throwing a Christmas party with carolers, angel choirs, downtown shopping til 8pm, visits with Santa, live nativities, and more. Also, Cahoots Handbags (205 South Commerce in Gainesville) is celebrating their store's birthday with a big bash on Friday night from 5-8pm (or later). 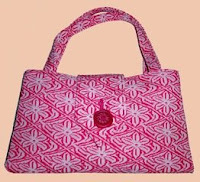 They'll be having major sales all weekend with bags at 25% off and clutches/peeps at 50% off. Plus, there will be lots of food, wine, champagne and beer. It'll be a bustling night downtown and there are some great shops around the square to take advantage of. This once-sleepy little town has a lot of charm and is finally starting to meet its potential. Friday, December 12: The 2008 9x12 Works on Paper Show at the Fort Worth Community Arts Center features artwork that may be any size, as long as it is on or of paper and can be mailed in a 9”x12” envelope. This year’s exhibit features artwork from most of the United States and several other countries. Artists of all ages have responded with small original paintings, drawings, prints, photographs, collages and other works on or of paper. All artwork is on sale for $100, and the artists will receive 80% of every sale they make. Local artist Chickenbilly will be there, so be sure to stop by! 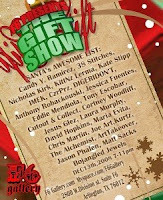 Saturday, December 13: The F6 Gallery in Arlington, Texas, will be having their Art "Gift" Show from 7-11pm. I have not been to this gallery before, but I'm looking forward to checking it out. They were voted Best Gallery of 2008 by Fort Worth Weekly. Saturday, December 13: A new MTV reality show, best described as The Apprentice meets Project Runway, is looking for creative, outgoing, self-confident, and TALENTED people who don’t yet have on-the job experience but who are PASSIONATE about FASHION, DESIGN, SEWING, SKETCHING, GRAPHIC DESIGN or any other aspect of the fashion business. An open casting call will be held in Dallas on Saturday, December 13, at The Dallas Marriott Quorum (14901 Dallas Parkway) from 10am to 5pm. MTV is looking to bring a group of people to New York City to work directly with a world-renowned fashion designer. This is a once-in-a-lifetime opportunity to be intimately involved in the fashion business, and to participate in the creation of a fashion line. At the end of our series, one lucky person will be rewarded with the opportunity of a lifetime! Applicants must be at least 18 years old. Only complete the top portion of the first page & sign the relase on the last page and bring it with you. Also, bring a copy of a valid Driver’s License or State photo ID and anything that shows your skills (i.e. designs, sketches, art work, etc.). RSVP at mtvfashioncastingdallas@gmail.com if you are attending. *Be sure to enter the December giveaway! Ends @ Midnight CST! Thanks for stopping by my blog. I heart chihuahuas, as you can tell. Looks like you have lots of cool stuff here. I will have to take the grand tour.